We are still pretty blown away that we are expecting our THIRD kid. It seems a little overwhelming still. Every time Mecalah has said she was pregnant I immediately clean out our cabinets and go on a health kick. There is just something about creating life that makes me question my mortality I guess. I want to know that I am going to be able to be there for my kids and be active and vital for as long as possible. We had actually already been making some lifestyle changes and I will happily brag about them for a moment. In the past 90 days I have lost ten pounds and my blood pressure is the LOWEST it has been in FIVE YEARS! I won’t tell you what it is (haha) because it is still high. But, like I said, we are making progress. I am lucky enough to be working with Anthem Blue Cross Blue Shield at the moment on their #healthydad campaign. As part of it, I wanted to share a couple of tips with you about how you can become a more #healthydad. The next three tips are things I have been doing recently to be more healthy. My first tip is to skip that late night glass of wine. The Pappy loves his Red Wine. That is certainly no secret and I used to drink an extra glass around bedtime because I felt like it helped me go to sleep. After doing some reading, though, I have discovered that isn’t totally the case. Yes it may be helping me go to sleep, but it isn’t helping me STAY asleep. As my body processed that alcohol and extra sugars it was lessening my REM sleep! I have slept much better cutting that glass out! Secondly, dump those canned veggies! This was easier this summer because I could simply walk outside and pick from my garden what I wanted. But even as it gets colder I am determined not to go back to the cans! I was shocked how much salt they have in them! My last tip for today is to schedule your “Well Daddy” visit. Your insurance company now covers your once a year check up! You wouldn’t think of ignoring the fact your kid was do for their “Well Baby” visit would you? So don’t ignore yours! We are all super busy and Anthem Blue Cross Blue Shield has a new program called LiveHealth Online! You can video chat with a Doctor, so basically telehealth is the new house call. Even if you and your kids are sick, there is no reason you can’t chat with your Doctor. Seriously, you can’t beat that. The Pappy would love to see one of y’all win! I want to say a big thank you to Anthem Blue Cross Blue Shield who is sponsoring this post. 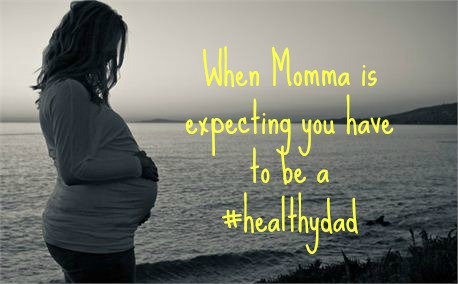 They are not, however, affiliated with the #healthydad video contest which is sponsored solely by XY Media. Anything written above by me is simply my advice as a parent and should in no way be used as the advice as a medical professional.